I’ve shied away from writing about whisky because I struggle to put my feelings about it into words even more than when it comes to beer. However, my early attempts at talking about beer had the same problem, so maybe the best way to improve my whisky vocabulary is to try and use it. Happily, I have an enormous collection of whisky to talk about. As well as more bottles than I should probably admit to, for my 40th birthday present from the wife this year I was given a spectacular collection of drams from the Master of Malt’s wonderful “Drinks by the Dram” range. My intention is to make this a bit of a weekly occurrence, at least until I’ve run out of new things to try. That should keep me busy for a year or two! 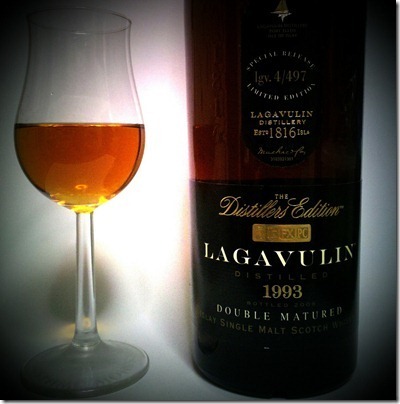 I’ll leave my Drinks by the Dram to one side for the moment, as it only seems fitting to start this series with the whisky that started my personal journey – Lagavulin. Specifically, their Distiller’s Edition. The Distiller’s Edition is a 16 year old 43% whisky, that has then been matured for a further six months in old Pedro Ximinez sherry casks – thus the ‘double matured’ moniker. The blurb will tell you this mellows out the raw 16 year old, and adds in hints of the sweetness and fruit from the PX. Anyone who’s tasted it will tell you it makes it a whole lot yummier. 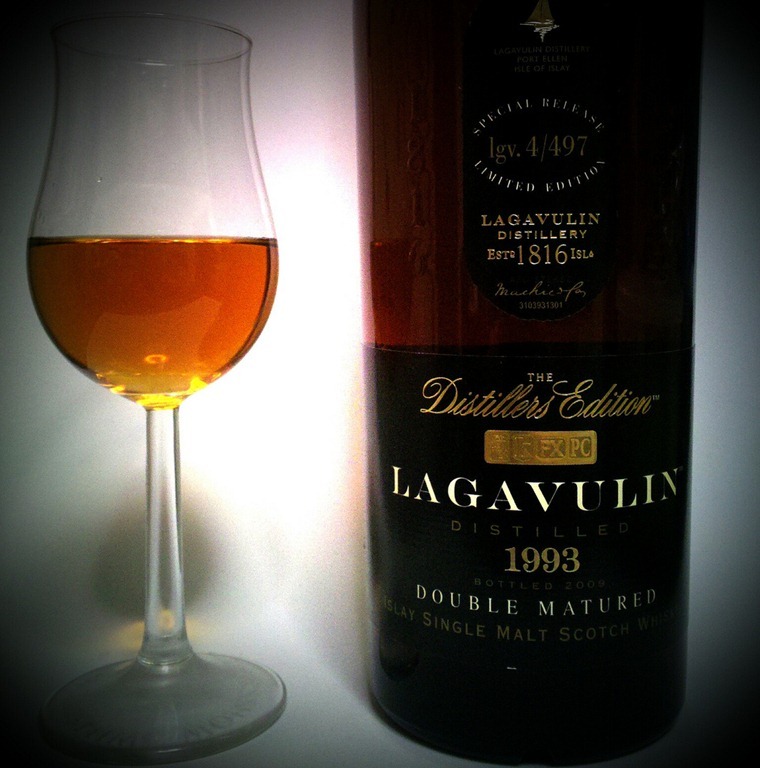 Unlike most whisky, which is ultimately blended to have a consistent taste across the years (a 16 year old Lagavulin will taste the same today as it did ten years ago, essentially) these Distillers Editions vary considerably from vintage to vintage, which is why they add the date statement – the date of the original distillation, in this case 1993. My introduction to Lagavulin was a 1984 Distillers Edition but as they go for a couple of hundred quid if you’re lucky enough to find one, I’ll stick to what Waitrose had on the shelf. It’s a fairly rich, golden syrup coloured whisky in the glass, with fairly good long legs. The nose has a generous but not overwhelming alcohol burn, a good sweet grain smell and a clean, sea spray tainted peat without being aggressively smokey. The PX adds some distinct vanilla notes and almost a fruitiness. A splash of water cuts back the fruit notes, and brings the sea spray much more to the front, and adds in some iodine notes. It’s a big dram in the mouth; quite light to start, with again a surprisingly grainy character – almost bourbon like. Then the Islay smoke comes rushing up, checked a little by hints of sweet fruit and leading to a wonderfully long peat finish. Water again knocks the fruit back a little; it’s still sweet but it’s a lighter kind of sweetness. It doesn’t touch the peat and you’re still left with that lingering smokey finish, but it opens up basic flavours and lightens up the body somewhat. Sheila was entirely right. Lagavulin is an excellent distillery to discover whisky through. Pete, what a lovely post. Formidable? me? Thank you, also for the link to my new blog. Formidable in a good way!